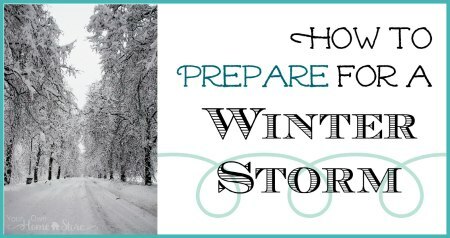 Do you know how to prepare for a winter storm? Most all of us will face some type of severe winter weather in our lives. Even if you don’t live where it snows, you may travel somewhere that does. One of the biggest risks from big winter storms is their ability to knock out your electricity, heat and communication services. With a bad storm, this can sometimes last for days. When Is a Winter Storm Serious? 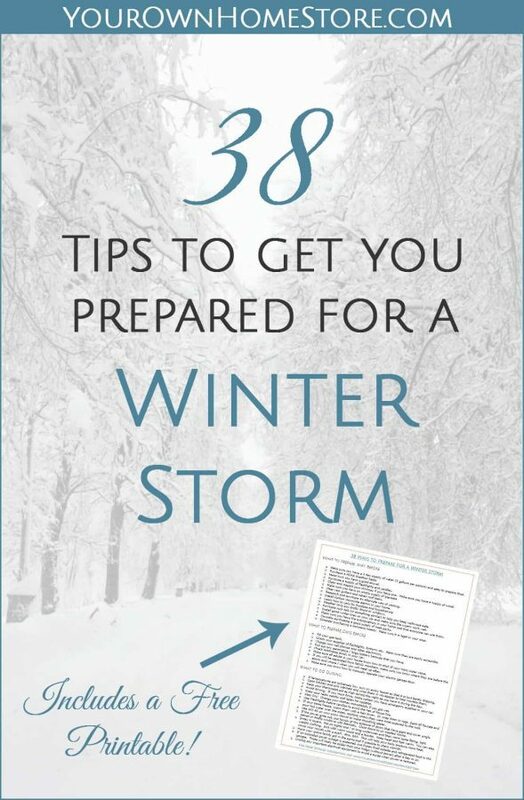 I came up with this guide during a bad winter storm in 2013 during a 15 hour long Winter Storm Warning. Make sure you have a 3 day supply of water (3 gallons per person) and easy to prepare food. Here is my favorite 72 hour no-prep food kit. Purchase a NOAA Weather Radio so you can stay aware of the situation if your other communication sources are cut off. Make sure it is battery operated and that you have extra batteries. Make sure you have a good shovel. You may need to dig yourself out before help gets there. Or you simply may need to dig out your car! 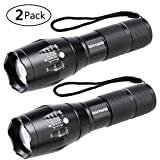 Purchase a supply of flashlights (with batteries) and candles. Clean and inspect your chimney if you have one. Make sure you have a supply of wood. Make sure you have an ample supply of blankets. If you power goes out, you will need as many as you can get! Clear rain gutters and repair roof leaks. Have an alternate way of cooking. A small “camp stove” works well for short-term emergencies. You may also consider a butane stove which is safe to use indoors (with a cracked window). Make sure that whatever you choose that you have enough fuel. Cook in a well-ventilated garage (like with the door open) to avoid carbon monoxide poisoning. Install carbon monoxide alarms in your home. The risk of carbon monoxide poisoning increasing during winter storms as people turn to alternate heat sources. Learn how to care for frostbite and hypothermia. Make sure you click on those links and print those out NOW in case your power goes out during a storm. Weatherstrip any drafty doors or windows. Purchase rock salt (or something similar) to help you keep walkways safe. Install good winter tires on your car and make sure the wipers work well. Make sure you have fire extinguishers in your home and that everyone knows how to use them. House fires are much more common during winter storms as people turn to alternate heat sources. Consider purchasing a good supply of heat packs. 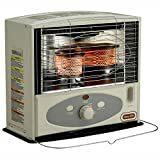 Consider purchasing a kerosene heater. Make sure it is legal in your area. Fill your gas tank. This will keep the fuel line from freezing. Check your supplies of flashlights, lanterns etc. Make sure they are easily accessible. Charge your cell phones and other electronics. 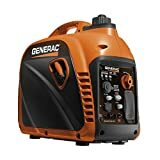 Pull out any generators / large battery backups that you have. DO NOT use a gas generator indoors. Check antifreeze levels in your car. Make sure all adults in your house know how to shut off your main water valve in case your pipes burst. If you will be separated from family members, make sure you know where they are before the storm and where / when you will meet up after. Make sure you know how to manually operate your electric garage door. If temperatures are extremely low (below 25 Fahrenheit), turn on every faucet so that it is just barely dripping. This will cost you a bit more in your water bill, but save you an expensive and time-consuming mess if your pipes freeze. Open kitchen and sink cabinets to allow warmer water to circulate around the pipes. You can also wrap them in newspaper to help insulate them. Keep your thermostat set as high during the night as you have it during the day to avoid pipes freezing. Avoid driving. If you must drive, make certain you have emergency supplies in your car. Keep your radio nearby and listen for updates. Stay Dry! Change your clothes immediately if you get wet. Use Flashlights before candles to avoid the risk of house fire. If your pipes freeze, warm them with a hairdryer. If you do not have power, wrap them in rags. Then, open all faucets and pour hot water over the pipes, starting where they were most exposed to the cold. Use WD-40 on your snow shovel to make shoveling easier. If the power goes out, put towels at the bottoms of doors that have gaps and cover single paned or drafty windows with blankets. Close doors to un-needed rooms. Again, if your power is out, especially for an extended time, dress in layers. Put on tights and/or long underwear if you have it as the bottom layer and then add on more loose fitting, lightweight clothing in lots of layers after that. Mittens are warmer than gloves. End with a tight pair of warm socks and a hoodie. Keeping your head and feet warm is essential. You can also cover your mouth with a scarf. Also, EAT! This will help your body produce more heat. Have your entire family get in the same bed if possible to share warmth. Grab some books and stay under the covers as much as possible! Don’t let that heat out! If an extended power outage is expected, put frozen food outside and refrigerated food in the garage. These will likely be colder than your fridge (without power) after a day or so. Unplug any important electrical equipment to avoid a surge when power is restored. Have you ever faced severe winter weather? What tips do you have for us? If you’d like a printable copy of this list so you can access it during a winter power outage, just click below! The thing I would add is to get some hand warmers. I buy a box of the warmers that last up to 18 hours. I put several in each car along with blankets and keep the rest of the box in the house. We heat our house with a big Amish designed and built wood stove so I don’t worry about being cold in the house. I stock up the house every fall with everything we will need and make sure my husband has tested the generator, snow plow and snow blower. I also make sure he has all the gas tanks and containers full. I even do a double check and top off the wood pile in the garage (garage is attached to the house) when they call for bad weather. We moved right after an ice storm and the house had no electricity for 4 days. We were fine if not a little cold but it taught us what we were going to need. We also RV off grid so we have a motor home that has all the essentials as well. We are doubly prepared I guess you can say. Great article and great tips! Our power was finally restored this afternoon after being down for over 110hrs (5 days of hell) following a severe ice storm.. Some people are still without power as I type this 🙁 The most important tip I have is fuel up and stock up if you have a generator!! Gas stations were constantly running out! Thanks Brigitte! I’m glad your power is back on! Being in the HVAC industry, I say always have your furnace checked. An annual maintenance call can prevent unexpected issues and reduce your energy costs. 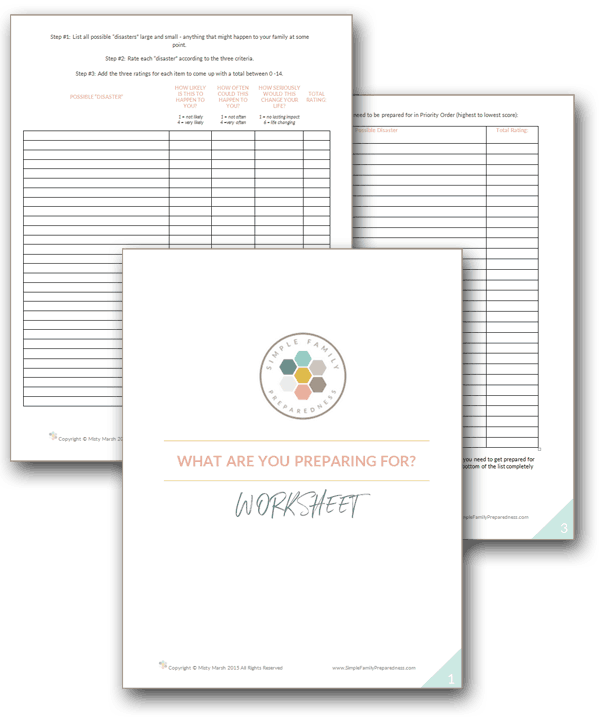 I’ve always been a “preparedness nut”… perhaps it stems from being a firefighter and seeing how quickly our comfortable world can fall apart around us. Or perhaps it’s simply a need I’ve always felt to never get caught unprepared for anything. In my basement I have a large stores of emergency food in #10 cans and buckets. I also always store a dozen cases of bottled water, have a dozen 1 gallon jugs of water, as well as two 50 gallon food grade barrels of water at the ready. I went to Chewy.com to order in bulk cat food for my two cats. Their favorites and it was much cheaper than buying in store and so easy having 6 mos worth shipped right to my house. So they are set as well. I also created an GOTO bag for the cats, which includes two food bowls, two water bowls, four bottles of water, two small boxes of their favorite kibble, six cans of their favorite wet food, toys, comb and brush, harness, collars and a leash. I keep this GOTO bag with their carriers. I also keep charged walkie talkies in the house in case of evacuations so I can stay in communication with my husband if cell phones are not working or we get separated. I also have a full complement of camping supplies, which came in real handy back in 2011 when we had a freak winter storm in October and the power was out for 7 days. Our town was cut off from supplies being brought in and while my neighbors were running out of food and water… my husband and I hunkered down knowing we were set for a while. It’s really nice to know you can sustain yourself if you absolutely have to. Sounds like you are very well prepared Brenda! Great tip Cyrus. Thank you! Back in the 80’s we had a major winter storm in Western Washington. Most people had no idea how to deal with it. In my area the power went out on Dec 18th, came back on Dec 24th, then went back out on Dec 25 and it was until after the 1st of the New Year that they figured out that my end of town got it’s feed from another direction from the rest of the town. Fortunately I had lived on the side of Mt. Shasta and in Montana so had some clue. When I bought my little house there it already had a flu so I found a used stove … with large flat tops. I accidentally learned while in Mt. Wonderful for cooking on while keeping warm. I had 2 other neighborhood families camping out with me in my little home during our long siege. My patio was my freezer and my garage was my refrigerator. We were all adults and most of us were out of work for the duration so we made the best of it and just enjoyed each others company, played games, card and played music and sang. Some of it was hard work but I still look back on it with fawn memories. Poweroutages can actually be kinda fun when you are prepared Lois! Thanks so much for the real life input and story! I wish i had this list during last year. This winter has actually been freakishly warm for where I live. Thanks anyway, because in Buffalo we might just get a blizzard next week for all we know. DRUGS, DRUGS, DRUGS ! Make sure you have ample supplies of ANY ‘scripts you take and other medical needs. The mail doesn’t ALWAYS get through and even if you can drive to a drug store, they might not always have your ‘scripts on hand ! Extra food and water for the animals. If you have a water pump, filling the bathtub with water beforehand is a great idea, so you can flush your toilets. If you have a generator, get some extra gas to have handy as the gas pumps at the stations need electricity to work. Make sure beforehand that you have enough of any medications you might need. Make sure you have at least one old-fashoined phone that only needs to be plugged in to the phone line and not the electric line. Thanks for the extra tips Darlene! 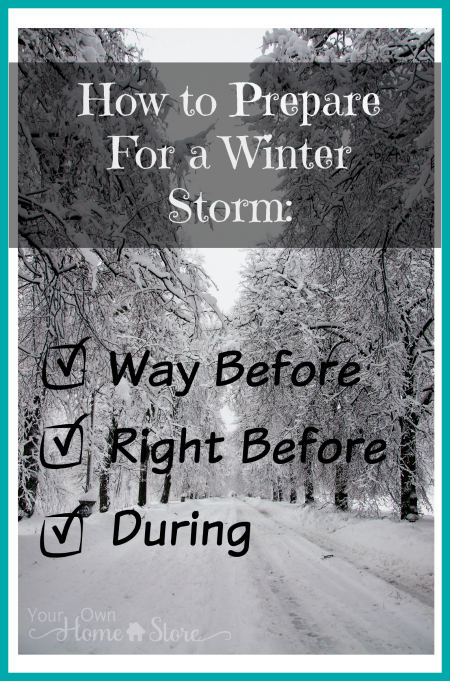 Thanks for this blog about winter storms. You included a few things that I hadn’t thought about. During 1 storm we were without power for 5 days and we filled the bathtub, in one bathroom, with hot water several times a day as we do have gas hot water. It’s a cast iron tub and holds heat quite well. We also filled the bathrooms’ and kitchen sink periodically with hot water and kept heating large kettles of water on the gas stove. We slept in recliners that we had pulled to the front of the fireplace (not too close, though). I need to stock up on flashlights again (my kids keep taking them and loosing them). One thing this article made me think about was emergency cooking. A few years ago we had a super bad winter storm and people were with out power for a while. Quite a few people tried to bring their BBQ grill inside and cook on that. There were a few close calls with carbon monoxide poisoning, but gratefully no deaths. 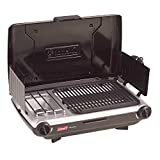 It make me worry about using any emergency stove with a flame inside. . I’m thinking adding a flame less heater like the Kindle Cook would be a great way to keep your family eating hot food and keep them safe. I always make sure to keep a good supply of the animal feed we need. Also I always freeze extra bread and some type of sandwich meat. We have a gas stove so I can cook on the top and the wood stove, but paper products are great to have on hand if the power is out. We are fortunite enough to have a generator that provides for most of our needs but only run it if the electric is out for a long time. We enjoy a day or two with out electric, it gives us all a good dose of appreciation for what we have on a daily basis. This is a great list you put together. If you use oil lamps don’t forget to have extra oil on hand and wicks. Yes, so true! Extra oil and wicks would be essential. And I have a few too many paper products. They are helpful even when the power isn’t out. (-: Sorry for my late response! Great tips! I am going through my first full 26 week cycle to put together my 72-hr kits for our home, but as winter weather is sinking in here in Minnesota, I’ve been doing additional research and planning for winter car survival. One of the most important things I was looking for was how to have drinking water available…clearly it will freeze if stored in my car and eating snow lowers your body temperature very quickly. The best recomendations I found were to 1) put a cooler with H2O in it before a car trip in winter weather 2) have something to melt snow with for drinking. I have heat cells that I figure I could melt snow over, so I just plan to get a sauce pan at a thrift store to keep in my winter kit. Additionally, I think the heat cells will be really great for keeping the inside of the car warm since they are safe for use indoors! 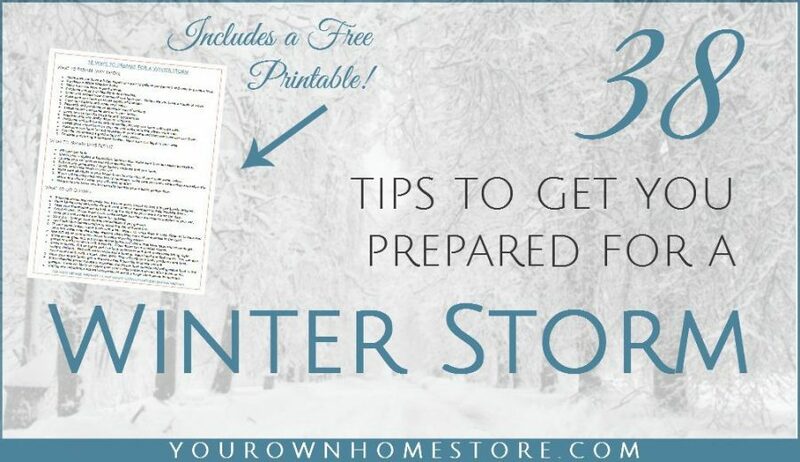 I hadn’t thought much about preparing my home, besides stocking up on food and water, so thanks for the great info! I love heat cells! So many uses! Thanks for your tips Caitlin and again, I’m sorry for my late response!